I wish I spent my New Year's Eve all dressed up, twirling with a partner around the dance floor (I'm a competitive ballroom dancer). Do you know how I actually spent it? Huddled at my desk, working on a major government contract (I'm also a co-owner of a consulting firm). It was necessary, but not the most exciting way to usher in the New Year. If you're familiar with my Huffington Post column, then you know that I'm a huge advocate of living passionately and keeping your life in balance, but even I need a reminder sometimes. Here's a simple resolution for us all - let's improve our balance, at work and on the dance floor. Not a dancer? Fill-in-the-blank for whatever your passion may be. 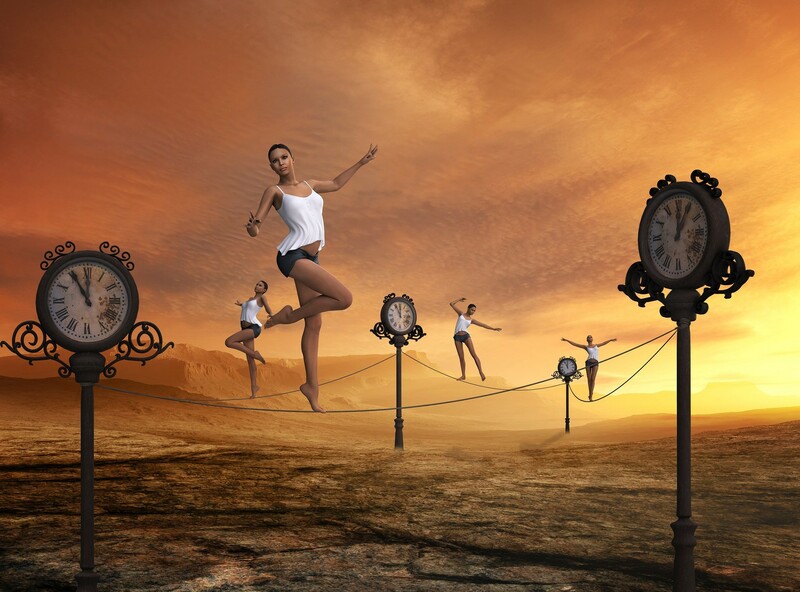 Many competitive dancers take the meaning of balance quite literally, believing that each day should consist of 12 hours of practice and a mere 12 hours for everything else. They succeed at competition, but lose friends and family in the process. This asymmetrical "balance" is unfulfilling; the applause, awards, and recognition for hard work is satisfying yet fleeting. Dancers have started to realize that they actually perform at higher levels when they spend less time practicing. Having families, careers and hobbies enable them to compete with less tension and anxiety. Loss or failure isn't as devastating when there are other bright spots in your life that shine. We all know that extremes lead to injury and burnout. My own mother overworked herself and developed diabetes due to stress. She has since learned the importance of having a balanced life and says, "No matter how successful you are and no matter how much you have, if you are not healthy and can't think clearly, then it doesn't matter." She used to promise that she would focus on hobbies, nutrition and exercise later - once her business reached a certain level of success. She has since redefined her image of success, understanding that later is now. Each day, create opportunities to attend to your body, mind, and spirit. Even though it may feel difficult to take time away from your work, it is essential so that when the unexpected occurs, you don't feel as overwhelmed and fatigued. Balance keeps you motivated on a daily basis and bolsters your reserves so you can respond to whatever life throws at you. Our potential for fulfillment is directly related to the balance we create among the social, professional, mental, physical, and emotional-spiritual aspects of our lives. Concentration on one at the exclusion of the others causes inner turmoil and dissatisfaction. Prioritize what is important and eliminate the insignificant. With fewer distractions, you'll have more time to maintain balance. Your performance in your personal and business life will improve when you understand and realize that less is more. Ask yourself, "How can I streamline my personal and business life and embrace simplicity? How much is 'enough'? What are ways I can give back to society and feel more fulfilled?" I plan to ask myself those questions very soon so I can improve my balance and find myself back on the dance floor in 2017. Hope to see you there!